The Serie A clash between Lazio-Fiorentina looked like it could be an interesting tactical battle beforehand between Simone Inzaghi and Stefano Pioli. This proved correct as the two sides played out an entertaining 1-1 draw where I was most intrigued by Fiorentina’s pressing, Pioli’s shape-shifting and interesting solutions in possession from both sides. These four factors will therefore be looked at in more detail in this article. Inzaghi chose to continue with his 3-5-1-1 formation and set up with Strakosha in goal, a back-three of Bastos, De Vrij and Radu, Marusic and Lulic as wing-backs and a midfield diamond with Lucas Leiva at the base, Marco Parolo to the right, Sergej Milinkovic-Savic to the right and Luis Alberto as the top. Ciro Immobile started up front. Pioli surprised with his team and setup by adopting a 4-3-2-1 formation where Marco Sportiello was in goal, Vincent Laurini, German Pezzella, Davide Astori and Cristiano Biraghi in defence and a midfield three of Marco Benassi, Milan Badelj and Jordan Veretout. Federico Chiesa and Cyril Thereau supported Giovanni Simeone in central attacking midfield positions. As mentioned Pioli chose to deploy Chiesa and Thereau in central positions when defending rather than have them defending wide areas as usual. The reasons are clear to figure out; firstly, Lazio stagger the central areas with their midfield diamond and by deploying his two normal wingers centrally instead he got five central players. Secondly, Lazio’s centred setup means they usually only have one player in wide areas which is their wing-back and that player could be pressed by Fiorentina’s full-backs. The 4-3-2-1 would theoretically give Fiorentina better coverage of the half-spaces where Milinkovic-Savic in particular normally thrives. Below is an image of Fiorentina’s positional structure in defence with three central midfielders and two attacking midfielders ahead of them to create a strong central presence and force Lazio into wide areas. When pressing higher, Fiorentina’s positions with one striker and two attacking midfielders logically meant they closed off the option of De Vrij progressing the ball into Lucas in midfield and steered Lazio’s build-up into the wider centre-backs. An example is shown below as Lucas is surrounded and he can’t be reached but the pass is steered into wide areas. Pioli had evidently noticed how Roma’s pressing disturbed Lazio last weekend and how Roma had targeted Bastos as the weak link of Lazio’s centre-backs when in possession. Roma’s two goals against Lazio came indirectly from Bastos making mistakes when in possession so it was logical for Pioli to target this. The below image is one example of how Fiorentina steered Lazio into giving Bastos the ball. Thereau would then press the Brazilian from the centre and out. This worked quite well as Bastos misplaced a few simple passes, but not just he struggled under the clever Fiorentina press. Lazio as a team struggled to cope with the aggressiveness of their opponent and the first wave of pressure was always well covered by the midfield three behind them. I’ve also highlighted Lucas to illustrate once again how he’s cut out of the game by the clever central pressing. After starting the game in a 4-3-2-1 which was a success in the way Fiorentina stopped much of Lazio’s normally effective and vertical passing and controlled possession for large parts, Fiorentina had still fallen behind due to De Vrij’s header from Luis Alberto’s free-kick. In the second half, Pioli changed things up by introducing Khouma Babacar in place of Thereau. Pioli now changed his shape to 4-3-1-2 with Chiesa acting as a number 10 behind Babacar and Simeone. Benassi, Badelj and Veretout continued in the same positions in midfield. The diamond can be seen below (although the symmetry isn’t perfect in this exact image as it look more like 2-2 rather than the 3-1 it was in reality). The introduction of Babacar gave two reference-points up front and he fired a few shots and combined well with Simeone and Chiesa. Pioli realized the problems the front two posed to Lazio and probably wanted crosses to go into the box as he changed shape again when replacing right-back Laurini with the centre-back Vitor Hugo and changed to 3-5-2. This meant Chiesa now moved out to the right wing with Biraghi pushing on down the left. Hugo slotted in next to Astori and Pezzella at the back. Fiorentina managed to create more pressure which led to the set-pieces at the end and one of them saw Fiorentina win a penalty in stoppage time which Babacar converted to equalize. Above we see how Fiorentina’s 3-5-2 looked in practice. As already stated, Lazio struggled to cope with Fiorentina’s effective pressing schemes. The side is so well-coached though that Inzaghi’s men find ways to overcome the pressing. 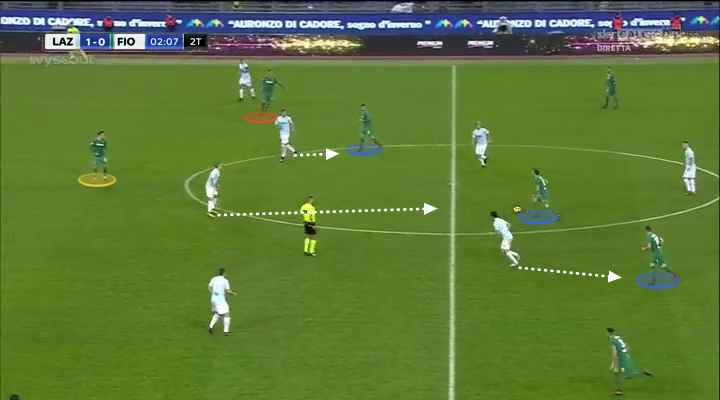 The two key areas on which they focused were positional changes to overcome the man-orientated pressing against Parolo and Milinkovic-Savic and exploitation of the ball-far half-space by diagonal passes. Here is an example of how the positional changes could look. Parolo is marked by Veretout and creates space centrally by making a run forward which drags Veretout with him. This obviously vacates space which Luis Alberto was intelligent enough to identify on multiple occasions. He simply moves into the vacated space to receive the ball and progress the attack. Similar actions could be seen on the left with Milinkovic-Savic vacating space for Alberto to move into. 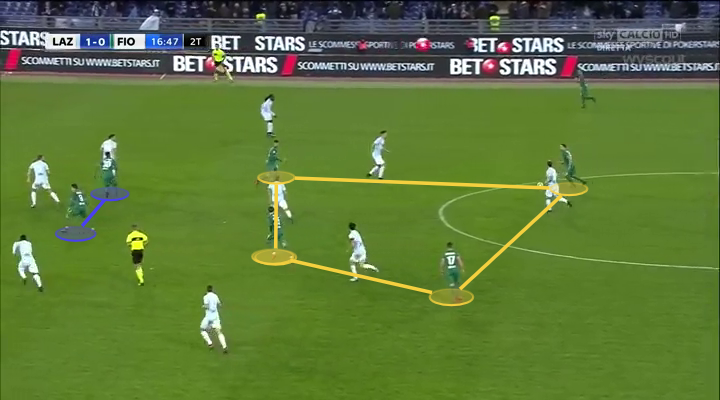 Diagonal passing from one half-space to the other was another method Lazio used to exploit space outside Fiorentina’s ball-far central midfielder. In the example below, Lucas acknowledges the great position Milinkovic-Savic finds himself in and reaches him with a diagonal pass along the ground which breaks Fiorentina’s midfield line. Below is another example where Lucas is at it again with a great pass to find Luis Alberto between the lines in the left half-space. We see how Lazio have overloaded with players on the ball-near side and Lucas switches the point of attack with a clever diagonal pass. Here Lazio exploits the poor positioning of Benassi who’s late back into position after a failed counter-attack. 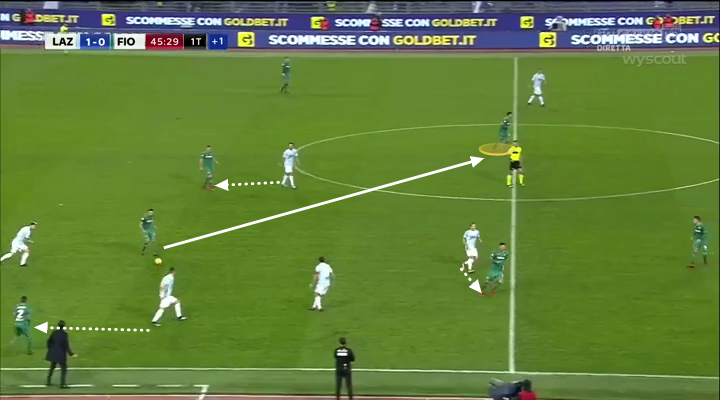 The last example is below where Lazio exploit poor horizontal compactness from Fiorentina. All three midfielders get beaten by Parolo’s pass to Milinkovic-Savic who can turn and attack the defensive line. Despite the impressive pressing of Fiorentina, Lazio managed to play through them at times thanks to this approach and Lazio were the better side in the first half and duly took the lead. In the second, Fiorentina grew into it and showcased impressive possession play too. After Lazio had taken the lead, they dropped deeper and allowed Fiorentina the initiative. Fiorentina duly took it and managed to carve apart Lazio’s normally solid midfield. Especially Marco Benassi impressed with his understanding of space and he exploited Lazio’s man-orientated midfield pressing by moving into space between Lazio’s midfield and defensive line. In the example below, Parolo has been attracted to Veretout, Milinkovic-Savic has pressed the right-back Laurini while Lucas (next to the halfway line) isn’t even watching the ball and focuses on Thereau. Lulic is in no man’s land while Luis Alberto is caught ball watching as Laurini passes to Badelj. The Croatian than continues the move by finding Benassi in the centre circle and Fiorentina can attack the back-three. Benassi has a freer role in the midfield than Badelj and Veretout and regularly looks for space to exploit between the lines. His intelligence in this regard is very impressive. Below he once again finds space behind Lazio’s midfield and receives the ball to attack the defence. Below is a third example of Fiorentina beating Lazio’s midfield. Parolo (closest to the bottom) has been beaten by a pass from the defence as he marked Veretout. Milinkovic-Savic marks Benassi, Luis Alberto is completely out of position and leaves Badelj free which sees Lucas get attracted to the Croatian midfielder. Lucas therefore has no idea of Chiesa’s (yellow) presence behind him with lots of space to attack. I’ve also highlighted Thereau (red) to show how central Fiorentina’s attacking midfielders really were. Simone Inzaghi’s Lazio and Stefano Pioli’s Fiorentina competed well against each other in a tactically interesting clash between two really good sides. Lazio impressed mostly with their attacking to create space through diagonal passes. They are really well-coached by Inzaghi and will likely continue to do as well as they have done so far. I was really impressed by Fiorentina’s performance in what I thought was their best performance of the season. Their pressing was really aggressive and effective while their methods in possession to exploit Lazio’s man-orientations was really impressive and successful. Pioli showed his tactical knowledge and how well-prepared his players are when introducing a brand new formation from the start and then changing to an additional two new formations throughout the game. Normally Fiorentina play in a 4-2-3-1 or 4-3-3 but the use of three new shapes will make them more flexible and difficult to plan for. With some talented players like Chiesa, the future looks bright also for Pioli’s Fiorentina.